Project Triton – our MY17 Triton Exceed – has now clocked up 5,000kms with the only modification to-date being the addition of a Provent 200 oil-separator, which seems like the perfect opportunity to regale you with my thoughts on the Triton, while it’s still mostly a stocker. Those 5,000kms were clocked up by taking a trip out to the Victorian deserts, just over the border from South Australia, and another trip from Adelaide to Alice Springs and return. In between those two trips, it’s also been punted around the burbs on an almost daily basis. If you’ve read my ‘The ten things I hate about 4X4 dual cab utes’ article, you’ll know that the stock suspension in these things can get my goat. In the case of our Triton, the suspension took a few hundred kilometres to settle in and lost much of the harshness evident from new when it did (something to keep in mind when test driving a low km demo). As the k’s have been clocked up, the suspension has become – dare I say it – a nice compromise between the firmness required for reasonable handling and the compliance required for a comfortable ride. Having said that, the pounding experienced over the few hundred kilometres of corrugated track, that is the round trip from Alice Springs to Chambers Pillar, introduced the first signs of front end wallow, that will no doubt continue to evolve as time and the miles are clocked up. The Triton’s shocks just aren’t good enough to last in any sort of mildly challenging environment. The rear shocks still feel great, no-doubt because they don’t have to work as hard to control the leaf-sprung rear-end. Leaf springs self-damp to a degree thanks to the friction generated between the individual leaves, whereas coil springs, as found in the Triton’s front strut setup, tend to want to bounce and keep on bouncing. More bounce to control at the heavy end of the vehicle, means the front shocks go soft first. Unfortunately, I know through experience that the undersized rear shocks won’t be far behind the fronts. In summary, the sub-standard suspension still irks me, but it is at least well sorted until the shocks start deteriorating. I’ve also noticed that Project Triton rides noticeably better than the identical MY17 Triton press vehicle, that David reviewed earlier this year. With similar mileage under their respective belts, the press car suffered from what I call ‘chassis shudder’ where the rear suspension would, over rough sections of road, fail to soak up the bumps and transmit the shock loading through to the chassis. Some MQ owners complain about suspension harshness issues well before others, so there would seem to be a fair degree of variance between individual vehicles in this regard. Running 20 psi cold tyre pressures on fast corrugated dirt roads resulted in a very acceptable ride and great control. The bump steer evident in previous generation Tritons doesn’t exist, at least until you run Light Truck tyres or try and lift the front suspension by more than 30mm. 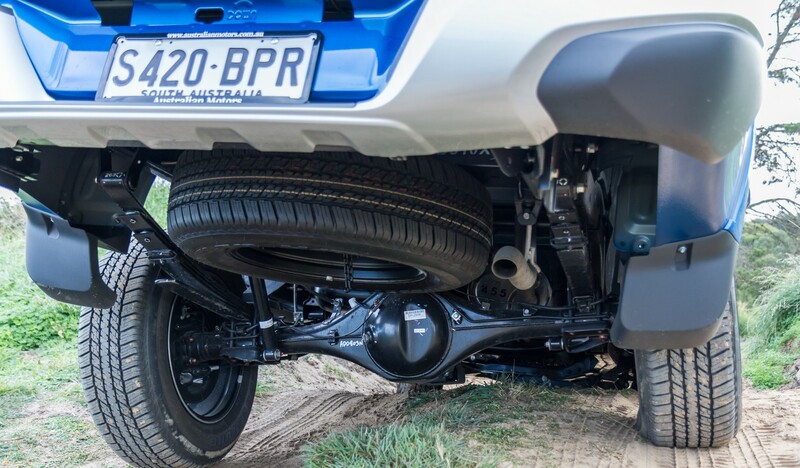 We recently put the Triton up against an MY17 Holden Colorado around the Adventure 4WD test track and noted that the Colorado had a smidge more ground clearance and slightly better articulation. The Colorado also had a more comfortable off-road ride, but not by much. On-road the Triton was significantly better to drive than the Colorado. It’s a ripper unit. Don’t be fooled by its size, this four-pot diesel has plenty of punch and is smooth and quiet, at least until you sink the boot in. My only real complaint is that it gets a bit thrashy in the upper end of its rev range, but it’s still working hard and providing plenty of poke when it does. 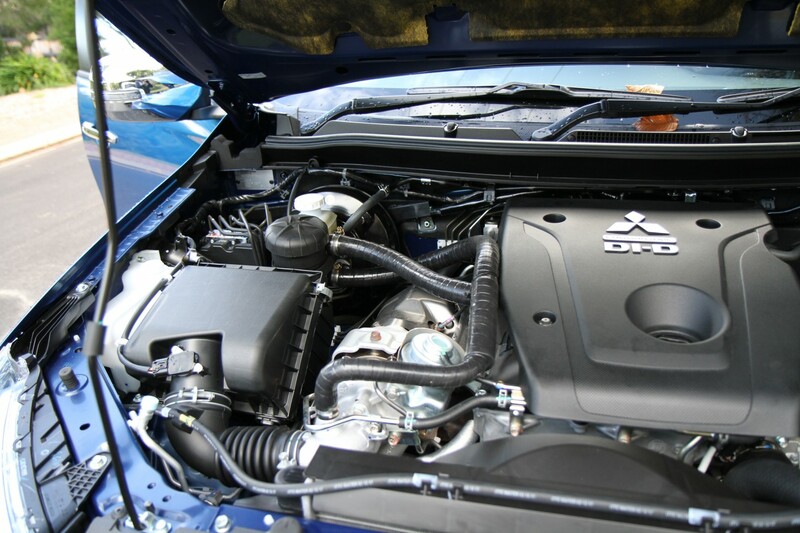 What you really notice about this fairly unique all-alloy diesel engine is that it’s light. 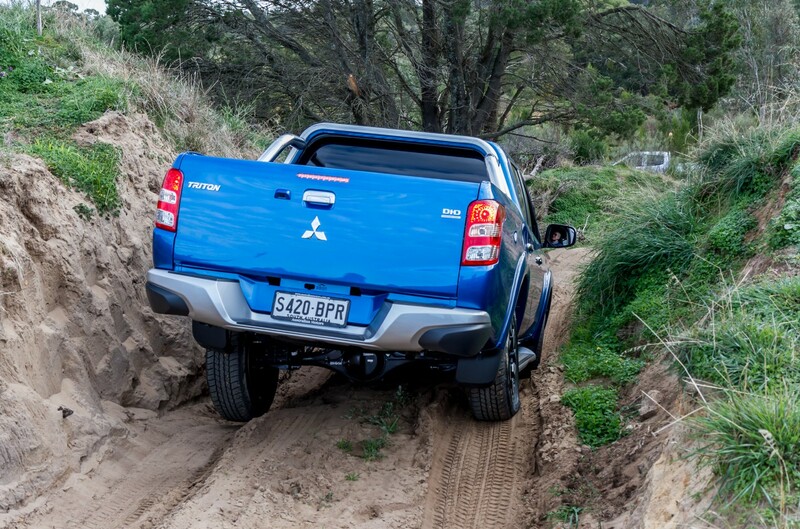 Compared to the other diesel 4X4 utes, the Triton doesn’t feel front heavy and that has allowed the Mitsubishi engineers to dial in some decent steering and handling, until those crappy shocks go ‘off’ that is. As an aside, I was recently reading a comparo of the top selling 4X4 dual-cab utes by some ‘experts’ at one of the better-known magazines. To their credit they all stuck their heads under the bonnet and noted the low mounted alternator that “would be difficult to replace on the side of the road”. They just failed to look under the wheel arch and notice the handy removable rubber flaps that allow complete access… Still not the best placement for an alternator, but it can be changed without pulling the hot side of the engine to pieces. Fuel efficiency is improving as the engine gets some time under its belt. Over the 3,000km or thereabouts return trip from Adelaide to Alice Springs, the Triton with three people and a full tray load on-board, managed to return between 8.6 and 9.2 L/100kms, with most travelling undertaken at the posted speed limits, or 110km/h in the Northern Territory’s 130km/h zones. 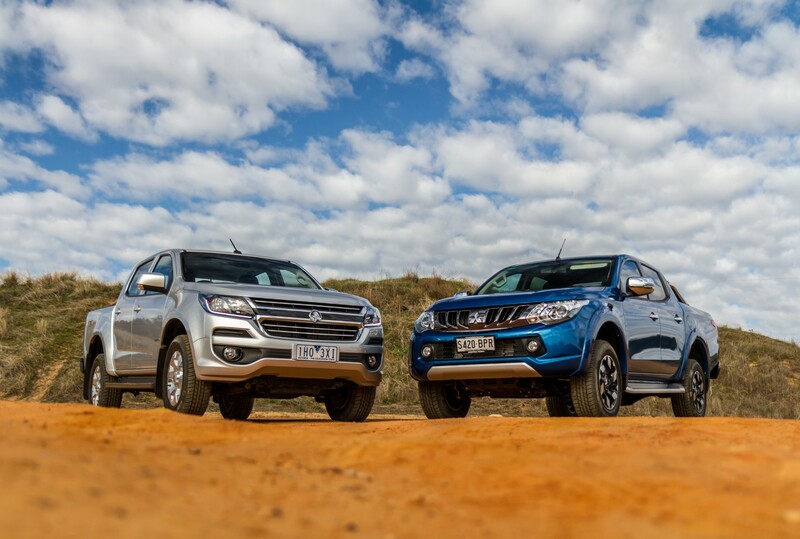 When driven back to back recently with the current Holden Colorado, the Triton despite being one gear short (five-speed auto compared to a six-speed auto) achieved 7.7 L/100km compared to the Colorado’s 7.8/L/100km over a one-hour drive through a mix of 60 to 100km/h zones in the Adelaide hills. It seems everyone wants a 6-speed (or more) gearbox these days, but have you noticed how the manufacturers (with one or two exceptions) are selling you a six-speed box with two overdrives? They’re chasing those magic fuel efficiency figures that get us all frothing at our bottoms, but in my opinion, they aren’t doing us any favours – fuel costs are the least of your worries with a turbo-diesel. I want a six-speed with one overdrive ratio that is easily held by the vehicle once it is travelling at 100km/h. I then want a lower first gear ratio for towing or off-roading and the other four ratios spread in a useable manner in-between. 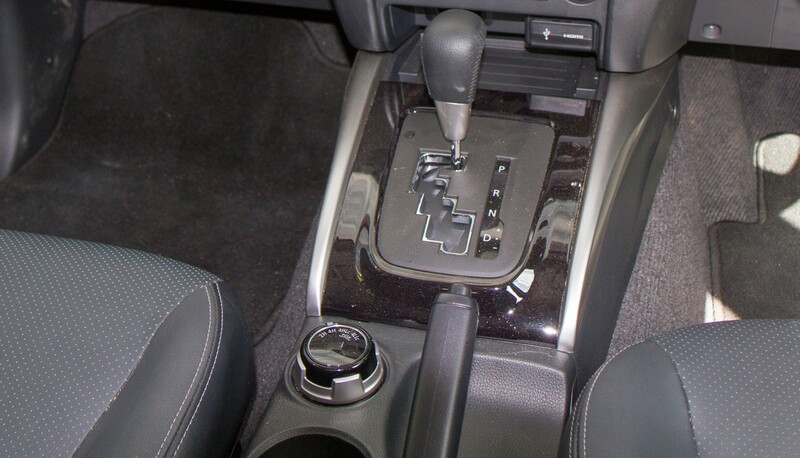 That’s a useful six-speed gearbox! Instead buyers of six-speed autos suffer with their vehicle’s constant need to change between to the two overdriven ratios constantly, or worse still drop into a higher gear than the speed warrants and try to hold it (stay tuned for my review of the six-speed Colorado!). Six-speed manual owners achieve nothing but some mostly useless hyper-economy driving that saves them a modicum of fuel, savings that they’ll need to put aside for their new clutch when they burn it out towing or off-roading, an issue that could be minimised with a lower first gear ratio. The Triton’s five-speed auto works like a charm, holds fifth in most conditions and is largely unobtrusive in the way it operates. I’ll take that over a fussy double-overdrive six-speed any day thanks. Interestingly, the MQ Triton uses the same Aisin five-speed auto as my NX Pajero, but it’s smoother, quieter and seems to work better in the Triton. Pleasantly rattle free over a few hundred kilometres of crappy dirt road driving. No dashboard movement, no doors rattling in their frames and no new rattles when back onto smooth roads. A massive improvement over my old ML and my current NX Pajero, the NX not requiring a rough road to rock some good plastic vibrations. The seats are comfortable, the infotainment system is brilliant and all up, the Triton is a nice place to spend a day behind the wheel. There were a handful of less pleasing aspects, including a front passenger side tweater (speaker) that developed an annoying intermittent vibration. The roof mounted sunglasses holder is rubbish and takes 20 minutes to close if you dare to open it. The map reading lights initially didn’t work but some rapid pushing of the on-off buttons had them both come good. 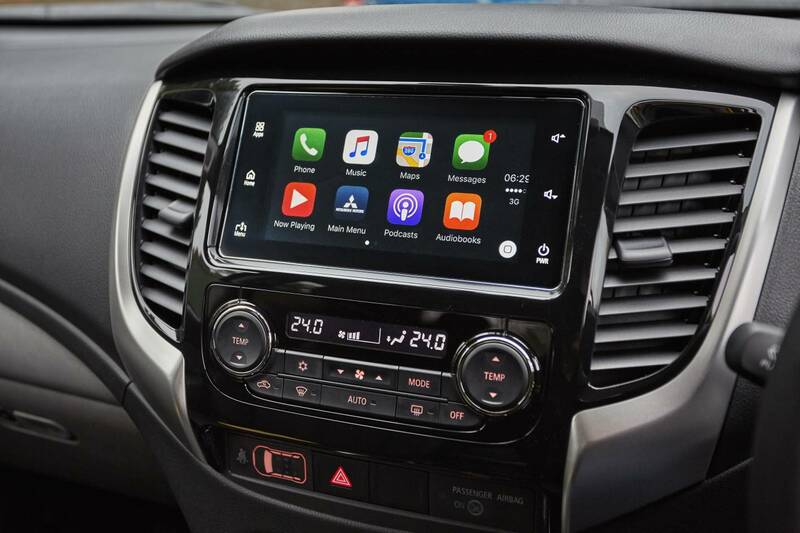 On a handful of occasions, the fancy dual-zone climate control system would drop the temperature of the air it was providing by around five degrees but would revert to normal operation, after I manually reset the temperature. You probably wouldn’t have these niggling issues in a HiLux, which in my opinion is a rung or two up the ladder when it comes to product quality. I’ve heard plenty of complaints from owners about the Triton’s thin and/or uneven paint, but aside from a thousand holograms etched into the paint by the dealer’s incompetent ‘delivery preparation’ process that they slug you $950 for (and they should know better), I’ve found little to complain about at this stage. Exterior paintwork complaints aren’t limited to the Triton. If anything the Ranger seems to suffer from more issues, with thin, soft and easily scratched paintwork being reported by owners. The Triton’s fancy HID headlights don’t live up to their promise and are a budget version of what should be a good headlight. Low beam is acceptable, but high-beam is a sub-par experience and the headlights themselves shake noticeably over anything but a smooth road. It bothers some more than others and to be honest I’ve noticed the same issue but to a lesser extent in the NX Pajero. How do I rate the Triton to-date? So far, the long-term ownership experience has been a good one and the Triton has surprised and delighted far more than it has disappointed. 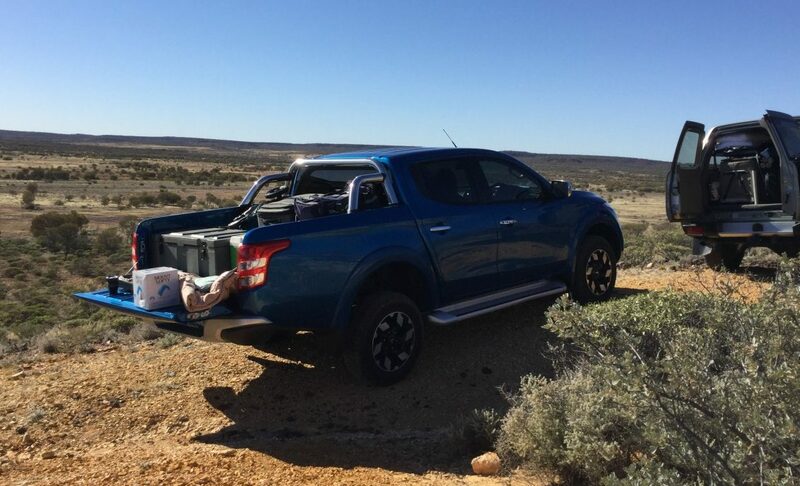 If I was back in the market for a new 4X4 dual-cab ute right now, it would still be a choice between the Toyota HiLux, Isuzu D-MAX and the Triton. What about the Ranger? I honestly don’t understand the current fascination that motoring journos have with the Ranger. It’s a great bus, but it’s over-priced, offers no quality advantage (the HiLux is better built) and is just that bit too big for my liking. Sure it’s got a 3.2 litre engine, but so does my Pajero and that doesn’t make it better, just bigger. Perhaps my biggest concern with the Triton is Mitsubishi’s recently introduced Limited Life Warranty. We’re going to start by fitting a Karrman 4X4 Suspension front diff drop kit along with a front and rear shock absorber and spring makeover (brands not yet decided on). The MQ, unlike the earlier ML/MN, doesn’t deal well with a 50mm lift in the front end, so we’ll be fitting one of Karrman’s high-quality kits to get around this issue, and detailing what’s involved and why you might need to do the same, if you own and are planning to modify an MQ Triton. Stage 2 will be a more suitable set of wheels and tyres. Stage 3 will be some bar work/protection. Stage 4 will be an engine tune of some description. Stage 5 will be a custom steel tray with dust proof canopy, built with a modicum of thought being given to aerodynamics.